Let’s get ready to boulder! 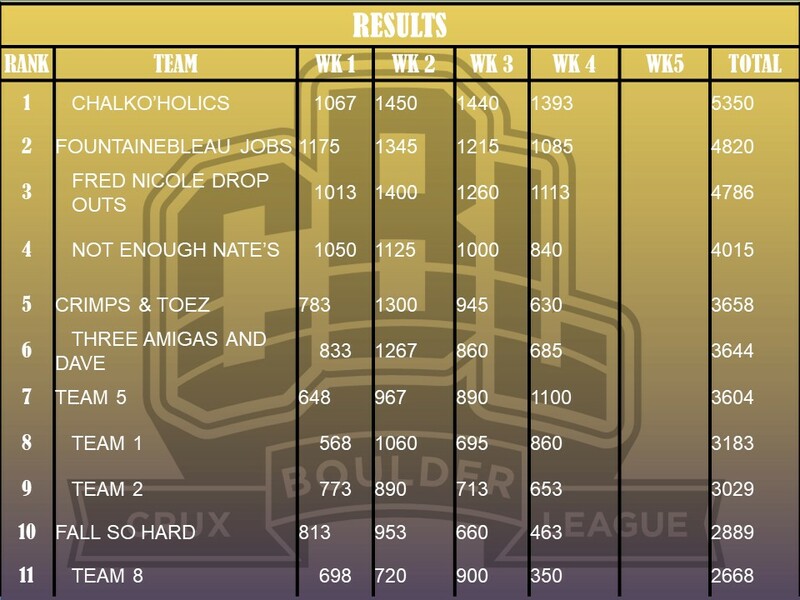 Crux Boulder League Season 7 sign ups are up! CBL is a fun, community league to bring everyone together in a friendly competition! Each season we’ve been making it bigger and better, so be sure to check out all the info below. Finals will be Tuesday, April 23rd! We will recognize 1st, 2nd, and 3rd place teams with individual trophies. 1st place team will get their name engraved on the CBL Cup. We will also award League MVPs in each category – the individual that scores the most points! *While the night starts at 6:00P, participants can start at any time. It will end at 9:00P. Each week 5 new problems are set per category (except Open has 6) giving 21 new problems each week. Problems are generally set in ascending difficulty with B1 (Beginner-1) the easiest and O6 (Open-6) the hardest. Harder problems within a category receive higher points. For every problem you send, collect one (1) witness signature from someone on another team. Send as many as you can within the 3 hours. Your top 3 problems count for your score. Tally all of your falls (onsite = 0) in the rare case that we need a tiebreaker. It doesn’t matter which problem you fell on, just tally and total all falls. You may count one (1) problem from the category below yours, BUT the points are only worth 10%. To do this, divide the points awarded by 10. (e.g. Intermediate climber completes Beginner problem B5. Circle B5 and count as 0.5 in Total row). You may climb problems from the prior week’s session (not from two weeks or more prior), excluding week 1. Scoring is similar to above (may be one problem from above for 100 points or below your category at 10% face value), BUT the points are further reduced by 20%. Example: Intermediate climber completes A3 from last week. 600 x 0.8 = 480 pts. At the end of each league, circle your top 3 problems and sum the total in the appropriate column(s), then calculate your week’s Score by multiplying the total sum by 100. You may be wondering why a B5 is given the same points as an O5. This is because teams’ points are averaged each week across the team members contributing that week. The total for a team is the rolling average across all points and # of contributing team members. (i.e. sum all points for team and divide by total # of contributing team members across those weeks). The team at the end with the highest average score WINS! If you have someone in mind that climbs at your same skill level, you may sub them in for the week that you are gone. This approach will better ensure the quality of the team member that you have subbed. If you cannot find a partner, we are gathering a sub list. Climbers can email info@cruxcc.com with their name, skill level, and availability to be put on the list. We need 24/hrs notice if you would like for us to pull someone from our list. Lastly, if we do not have anyone that can sub in on the date that you need and at the skill level. We will post for walk-ins on the day of. Subs that are Crux members will not have to pay to participate; however, non-members will be charged a reduced day pass of $10. Please share this info with your friends that didn’t sign up, but might be interested in subbing for a day. There are 4 people on each team. Crux will place people on a team. Each team is mixed with climbers of different skill levels; however, the team members’ categories do not matter because the scoring system is not weighted heavier for harder problems (see below). Every participant will get a yellow shirt with a purple CBL logo and free drinks for the finals!